Build My LED uses LEDs from Luxeon Rebel and Rebel ES Philips Lighting along with those made by Everlight Shuen Electronics. While Philips is a household name, the latter company may need an introduction – Everlight is based in Taipei, Taiwan and has had an international presence since 1983. Everlight is one of the 10 largest LED companies in the world. ‘Shuen’ is Chinese for ‘shiny’ or ‘bright’. Acrylic materials often attenuate (weaken by absorption) ultraviolet wavelengths. This is not the case with the material used by Build My LED – no cutoff point is apparent at wavelengths below 380nm. Most of the radiation generated by the UV LED is in the visible range. See Figure 1. Far Red (Max. Wavelength ~730nm): Under conditions of saturating or super-saturating light intensities, far red light (absorbed mostly by photopigments associated with Photosystem I) will prevent a ‘traffic jam’ of electrons within Photosystem II. The use of this light by zooxanthellae is speculative on my part, but remains an interesting possibility. White (Broad Spectrum,400-700nm): LEDs emitting ‘white’ light are actually blue LEDs coated with a phosphor that absorb blue light and fluoresce it in a broad bandwidth. ‘White’ LEDs are quite popular in luminaires built for aquaria. I chose these to offset the blueness of the light and to add small amounts of light in the yellow to red portion of the spectrum. Interestingly, the first luminaire I ordered contained green LEDs to excite the zooxanthellae accessory photopigment peridinin. After a discussion with Build My LED co-owner Nick Klase, I was advised to add neutral white LEDs to the blue ones, as these would be a more efficient source of green light (and the spectrum of this fixture is subjectively very pleasing). In the LED industry, the low quantum efficiency of green LEDs is known as the ‘Green Gap’. Blue and Red LEDs are very efficient, but scientists have yet to produce green LEDs that exhibit similar radiometric efficiencies. As a footnote, I tested the cool white LEDs and found them to be 7,123K with a CRI of 87. Figure 2. Spectral signature of a custom-built LED fixture containing 450nm, 470nm and 4,500K ‘neutral white’ LEDs. 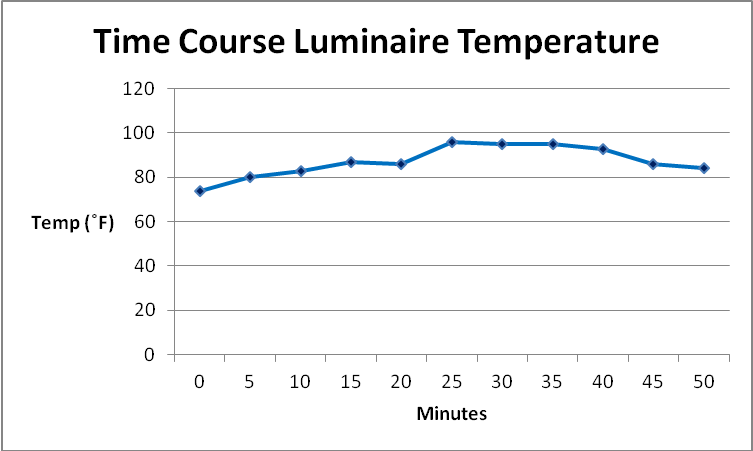 Figure 3 demonstrates the light intensity of a 48″ custom luminaire from Build My LED containing LEDs generating light at 450nm, 470nm and 4500K neutral white. The 60 degree beam angle on my fixture was able to produce PAR values in excess of 550 µmol·m²·sec, which is a very high number considering the fixture only consumes approximately 75 electrical watts. If you need even more PAR, the intensity maps on the company’s website claim the 30 degree beam angle can deliver over 1,300 µmol·m²·sec at the same mounting height across the length of the fixture. 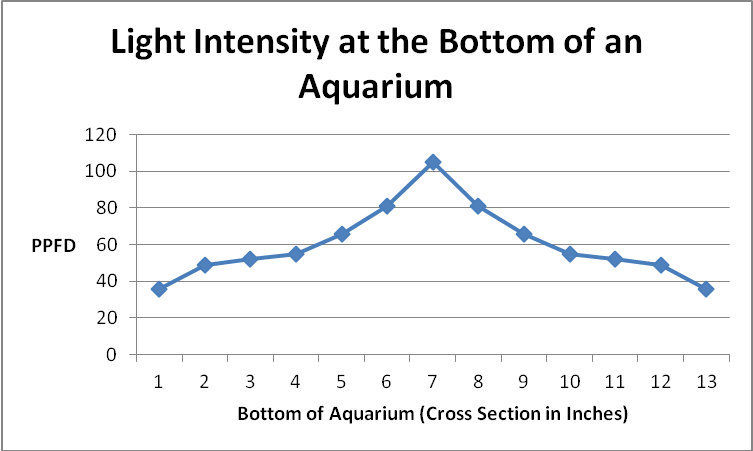 In addition to high light levels, Build My LED has been able to solve two of the issues prevalent with LED fixtures in the aquarium industry. Looking at Figure 3, you will not see any lateral hotspots in the intensity map. Build My LED fixtures produce very uniform light across the entire aquarium, which is in contrast to the hotspots associated with the LED ‘cluster’ design currently utilized by many fixture manufacturers. The cluster design is used to avoid color separation in the aquarium (which is often referred to as the disco effect), but Build My LED utilizes a proprietary optical system design that eliminates the disco effect in the aquarium. Figure 3. 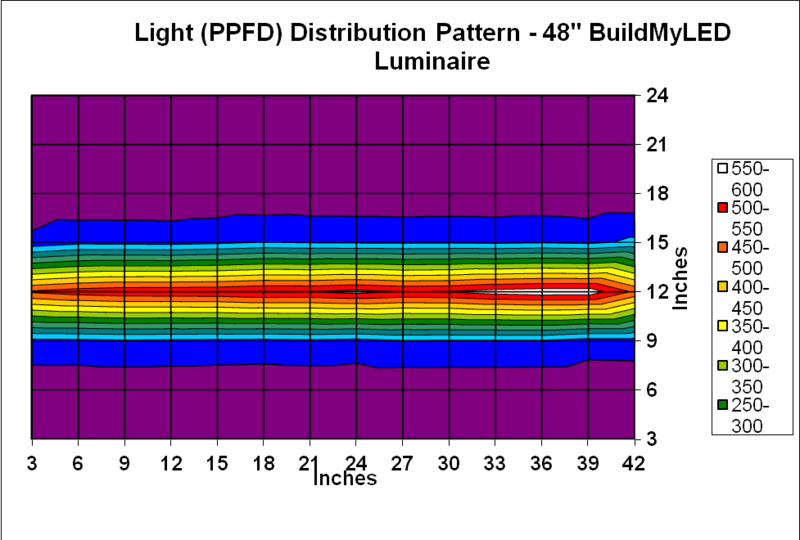 Light Distribution (PPFD) of a 48″ Build My LED luminaire situated 3″ (1.2 cm; in air) above the quantum sensor. Figure 4. 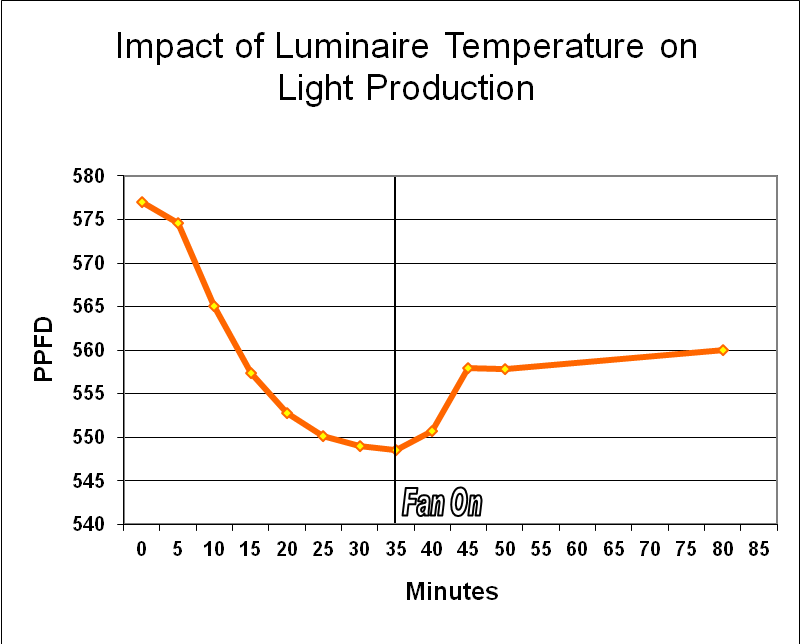 Light intensity (PAR, µmol·m²·sec) at depth (17.5″, or 6.9 cm) and fixture 2.5″ (1 cm) above water level. Note this displays a cross section of the aquarium. Figure 5. 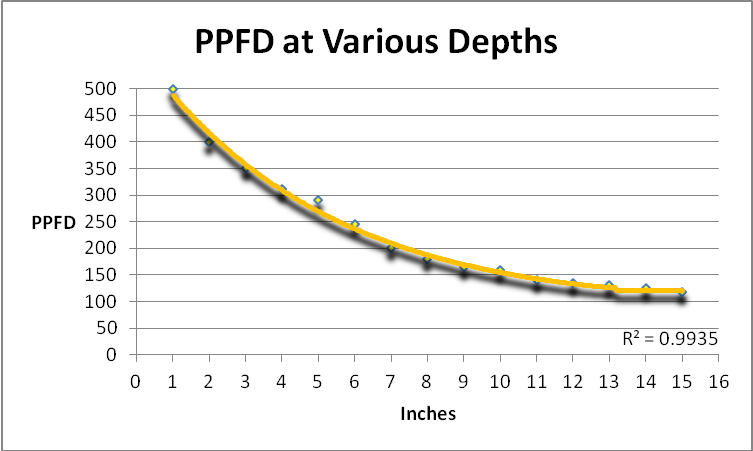 PPFD values at depth. LED fixture is 2.5″ (1 cm) above the water surface. The luminaire is constructed of aluminum with plastic end caps. Ingress Protection Code (sometimes called the International Protection Code) is a system to describe an electrical component housing’s ability to exclude dust and moisture. It consists of two digits – the first is for dust (scale of 0 – 6), and the second is for moisture (scale of 0 – 8). The rating for the luminaire itself is IP66, meaning the enclosure is dust tight and allows no ingress. In addition, the moisture resistance rating of ‘6’ means the enclosure allows no ingress of water when water is sprayed from a water jet of 12.5mm (or ½”) diameter from any direction at a pressure of 100 kPa (14.5 psi) and a flow rate of 100 liters (26 gallons) per minute at a distance of 3 meters (10 feet) for at least 3 minutes without harmful effect. IP66 is equivalent, in respect to dust and water ingress, to a NEMA (National Electrical Manufacturers’ Association) 4 or 4X enclosure. A rating of IP66 does not mean protection against immersion or mean ‘waterproof’. 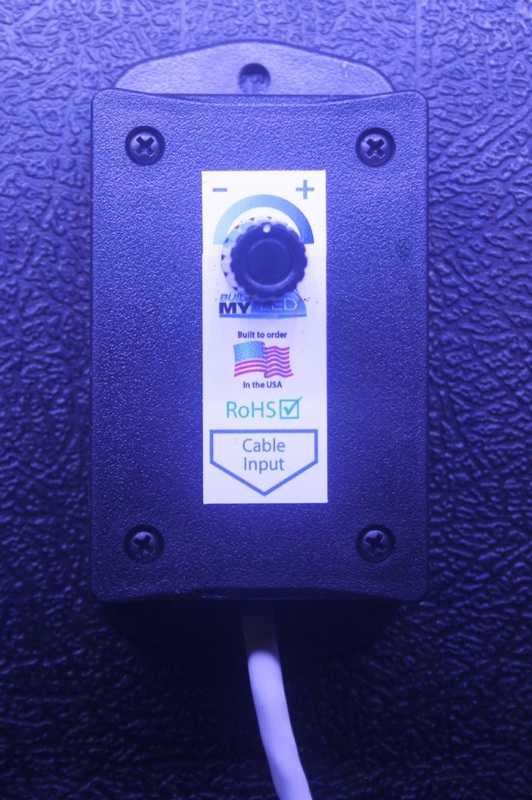 The driver/ ballast carries a rating of IP67, meaning it can be immersed in water of up to 1 meter (~3 feet) deep for a short period of time without harmful effects. I don’t mean to suggest that reasonable care shouldn’t be exercised in order to avoid water ingress into any electrical device, but it is nice to know that these fixture and driver are built to tight standards. Many hobbyists use an Apogee quantum meter for taking PPFD (or PAR) measurements. Some Apogee quantum meters (Logan, Utah, USA) offer the option of ‘sun’ and ‘electrical’ measurements leaving the hobbyists wondering which to choose. After comparing the Apogee’s measurements to those obtained by a ‘lab-grade’ quantum meter (Li-Cor Biosciences, Lincoln, Nebraska, USA), I recommend using the ‘sun’ mode. At the time of this writing, a 12″ luminaire is priced at $119, a 24″ at $179, the 36″ at $229, and the 48″ at $269 (discounts are available for multiple orders). Online ordering allows selection and submittal of all options – simply click-and-drag the LED options into the luminaire template, and click on other options. There is a tutorial for using the ordering portion of the website, but I found it unnecessary as the site is intuitive. Spectral characteristics of the LEDs were measured with an Ocean Optics fiber optic spectrometer. Kelvin and Color Rendition Indices (CRIs) were determined through use of Ocean Optics’ SpectraSuite software after the spectrometer had been calibrated to a LS-1-Cal 2,800K halogen-tungsten light source. Photosynthetic Photon Flux Density (PPFD, 400-700nm) was measured with a Li-Cor 1400 quantum meter/datalogger equipped with an underwater quantum sensor (calibrated to ‘air’) , while underwater measurements were taken with an Apogee quantum meter.